With apologies for being late to the party - don't believe the studio spin - if you don't like baseball, you won't like "Moneyball". It's 100% baseball - and like the sport, it's replete with a dizzying dose of stats - mostly hits but some errors to boot. Brad Pitt plays payroll-challenged Oakland A's GM Billy Beane - trying to compete with a budget roughly a third what the big boys (Red Sox/Yankees) roll with. The years have turned the former 'Fight Clubber' into a facsimile of Robert Redford - same look - lesser talent. Like virtually all actors, Pitt plays slight variations of himself in his big screen roles - problem is, there are numerous times that Pitt comes off as clueless when it comes to baseball - not because of his character, but his acting. Pitt isn't as consistently commanding as a general manager needs to be; in one of Pitt's first meetings, he's upstaged by the opposing GM - something that an A-list actor should never be guilty of (and don't get me started on Pitt's incessant biting his lower lip habit). Jonah Hill (before he went anorexic-like) is fab as Pitt's stat-obsessed Yale grad assistant - his acting minimal but delivering maximum impact. Philip Seymour Hoffman delivers a fine performance as the team's manager, although his eyebrows are beyond bizarre. 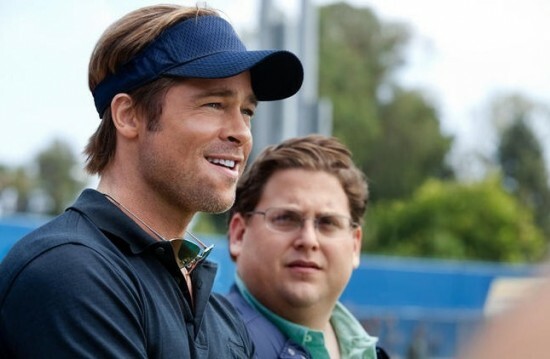 With a runtime of slightly over two hours, "Moneyball" is a good 20 minutes too long - the climaxial game (have petitioned the English police for legalization of that word) feels like an 18-inning contest. The end result mirrors the actual season "Moneyball" depicts - a memorable run but a loss in the final game played.